Anyone who has spent anytime with me knows I have an obsession with quality coolers. I often get asked, “What cooler should I buy?” To be honest, I didn’t have a good answer, as the market has been flooded with high quality coolers all tailored to a certain niche. While most of my friends are simply looking to see what cooler holds ice the longest, I also like to consider other factors in features such as price, texture, handles, and accessories. I decided to conduct a test thorough enough that I can answer the common cooler questions. For this review, I am comparing the three most common sizes guys are using today: 35, 40, and 45 quart. 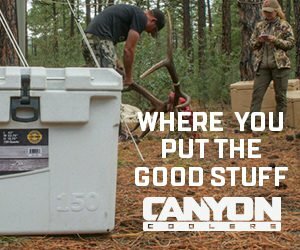 I compared the Yeti Tundra 35 to the Canyon Coolers Outfitter 35. In the 40-quart category, I pitted the Icey-Tek 40 against the Frostbite Dual 40. For the big guys, I put the Pelican Elite 45 up against two new companies, Orion and her 45 and Frostbite’s R 48. 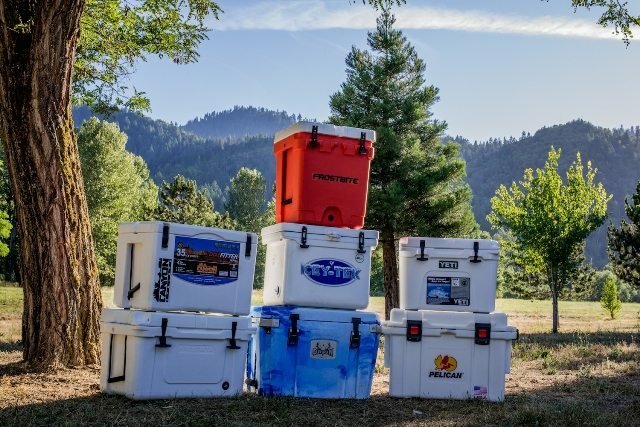 All of these coolers were tested in the same conditions. 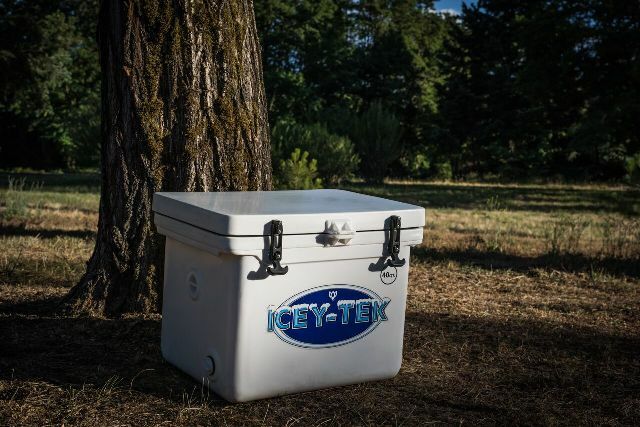 Every cooler company loves to throw out numbers on how long ice stays in their coolers, but most people do not get the same results as they do. I am putting these coolers in their respective categories head-to-head to see what cooler performs better under the same circumstances. 1) Pre-cooling your cooler is probably the most important thing anyone can do to preserve ice. 2) To compare the coolers cooling capabilities on a more even basis. A cooler that is thicker will lose ice faster due to the fact that the ice has to cool more insulation than if it wasn’t pre-cooled. Besides just the cooling capacity test, I also I looked at handles, latches, finish, drain, and any special features a specific cooler may have. I also had my five year-old daughter and her friends open each cooler to see if they are kid friendly. Finally, I weighed each chest empty and full of water to get a value on actual capacity instead of taking the manufacturers’ word for it. Last I looked at their respective warranties. We’ve all grown accustom to Yeti and their features. They are probably the oldest and most trusted name in the cooler business. The Tundra 35 holds up to the name and is built using the same parts as its bigger brothers. Handles- The main handles have a low-stretch rope and comfortable grip while the molded-in handles are nice and deep to get a good grip on the cooler. I do wish they were a little wider to make a heavier cooler more comfortable while lifting. Latches- These are the same as every other Yeti handle that people have been accustomed to. They seem to provide enough tension to keep the lid snug but still easy to open. Kid friendly? YES! 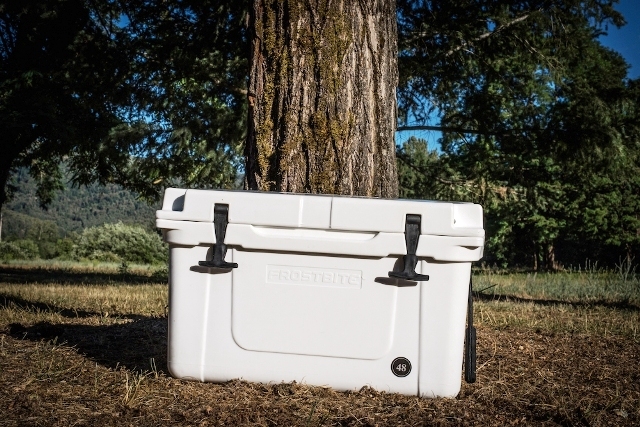 Finish- Out of all the coolers, the Yeti has the smoothest texture. The lid and body are ideal for fisherman who has to wipe away fish slime on a regular basis. Drain- Again, Typical Yeti with an easy-to-grip drain but it is not attached so there is a risk of losing it. Features- The lid is lockable in two corners and the cooler has rubber to keep from slipping in the back of your truck or on your boat. Also included, is a sliding tray to keep items out of the bottom of your cooler. Actual capacity- This is where Yeti drops the ball, the actual capacity is 26.92 quarts. That is a big disappointment thinking you purchased a 35 quart cooler. That is 23% smaller than what you think you are getting. The cooler weighs 20 lbs empty. This is one of my favorite coolers in the line up. You can tell this thing can take a beating at first glance. The lid is 3” thick and the sides are up to 2.75″! This thing is a serious cooler and an awesome value for the penny pincher. Handles- The main handles are rope based but differ by being two low-stretch ropes on each side to prevent the handle from slipping over the rope. The molded in handles are very nice but could be a little deeper to get a better grip on a loaded ice chest. Latches- A sleek look of the cooler is accomplished by the recessed, cam style hinges. They are very easy to use and kid approved! Finish- The texture is semi-smooth and all the corners are beveled leaving a blocky look to the cooler. Drain- It is very easy to use and is attached so you wont lose it. While it is not huge, it is adequate for a cooler this size. 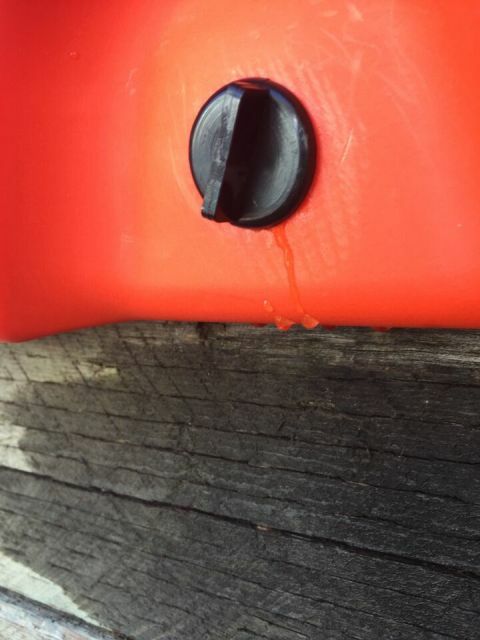 Features- You can lock it on the sides of the lid in the recessed holes and it also features non-skid feet. Their logo is molded into the lid as well. Actual capacity- This cooler actually holds 40.38 quarts and weighs 23.5 lbs empty. These guys have been in the game for a while and should get more credit than they do. They make an economical cooler that can take some serious abuse. Handles- It is simply a molded in rail that is comfortable, however it could use more of a lip to get a better grasp. Latches- They are the rubber pull style found on many well-made coolers today. 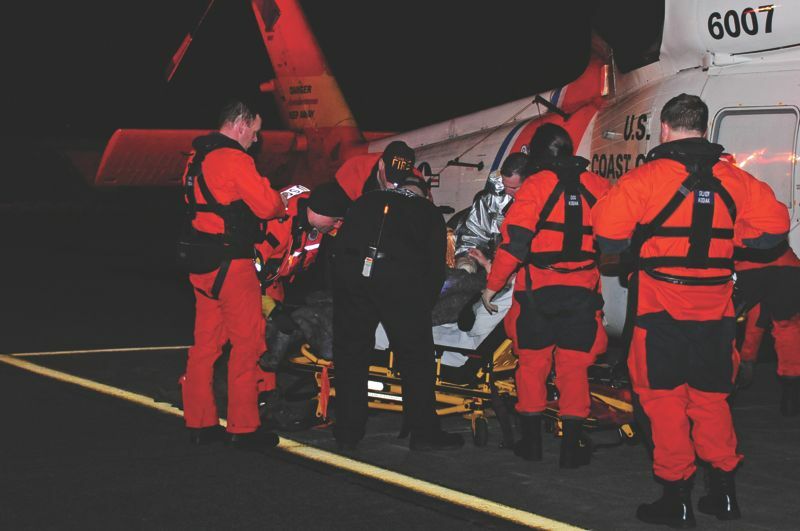 They are nothing special but more than adequate to get the job done. While the kids opened them easy enough, a few fingers were pinched when re-latching the lid. Finish- Semi smooth and rounded corners give it a nice, clean look. The inside of the cooler sports a soft blue look that is unique. Drain- This guy has two oversized, (unattached) drains so no flipping it around to reach your plug. He also has built in strainers so you do not lose your ice while draining water. Features- Lockable lid to keep unwanted fingers or paws from digging into your food. Actual capacity- 43.5 quarts and weighs 19 lbs empty. This is a one-of-a kind cooler not only because of its efficient cube design, but the fact it doubles as a liquid dispenser. The drain plug can be removed and a tap can be used in place to serve hot or cold beverages. 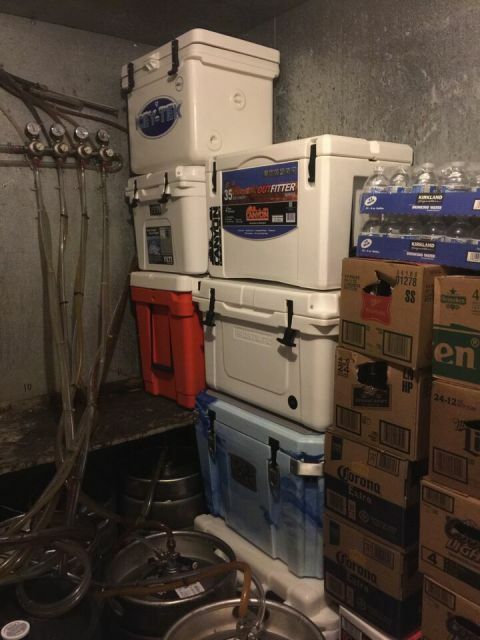 You can take this cooler from the job site or soccer game straight to elk camp. Handles- The rope is a little stretchy and a tad bit on the long side especially for being a tall cooler. The molded handles are very comfortable however. Latches- Again, your typical, rubber pull style handle. They are nothing special but more than adequate to get the job done and while the kids opened them easy, like the Icey-Tek a few fingers were pinched re-latching the lid. Finish- A semi smooth texture and rounded corners offered in orange, blue with a white lid, or tan with a tan lid. Drain- The actual drain plug seems cheap and did not fit well. I had to put Teflon tape around it and still leaked. The plug is my biggest complaint with this cooler. 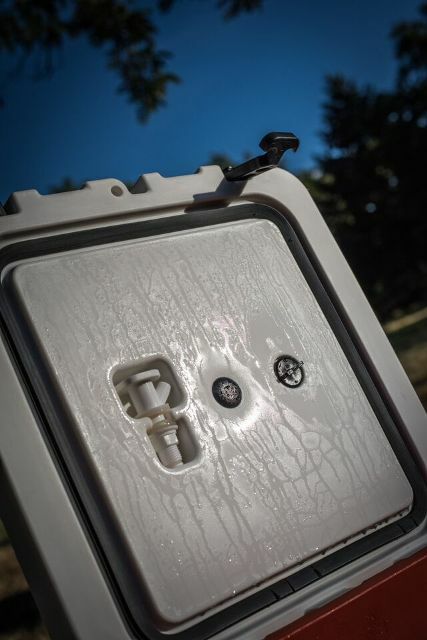 You can use the tap as a drain plug but might get old holding the button down to drain the water out of your cooler. Features- It has integrated storage in the lid for the drain plug and spare tap and it is also lockable with a long shank lock. Actual capacity- 43.5 quarts and it weighs 21 lbs empty. A trusted name in durability entered the cooler industry a few years ago and is living up to their name with this guy. It’s a reasonably priced cooler with big features that can be found at Costco if you’re lucky enough to see them before they are sold out. Handles- My favorite feature is the solid handles. It provides a solid feel when lugging this into the back of your truck. It also has molded in handles which are round that are comfortable when you need to get a lower grip. The handles do stick out a bit, making the cooler take up more space when in the back of the truck. Latches- They are the same style latches found on all Pelican products but oversized so you can open it with a gloved hand. The kids opened the cooler easily. 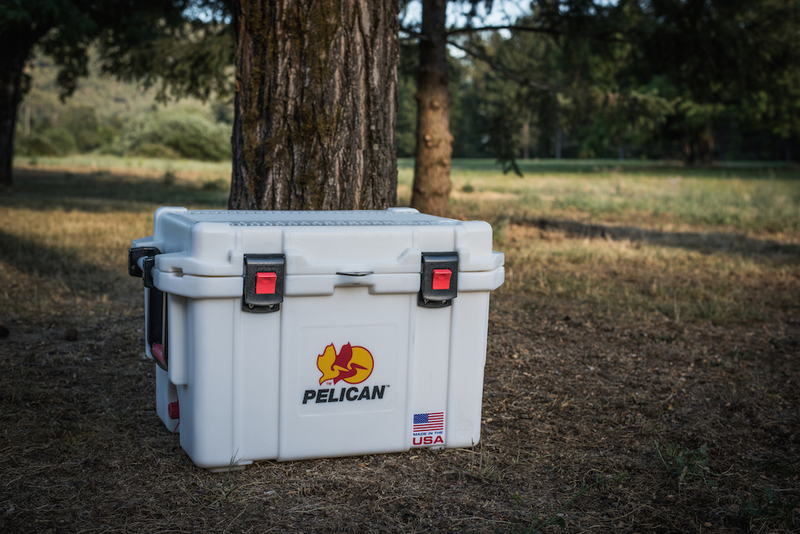 Finish- Semi smooth texture on the body and a rougher lid give the look of all Pelican products. Drain- An attached drain plug that is threaded so you can hook a garden hose to it. This might come in handy if you your cooler lives in a specific spot and you want to drain the water away from the cooler. We used to have this drain setup on our fire engine when I worked for BLM. Actual capacity- This cooler holds 50.96 quarts and weighs 35 lbs empty. 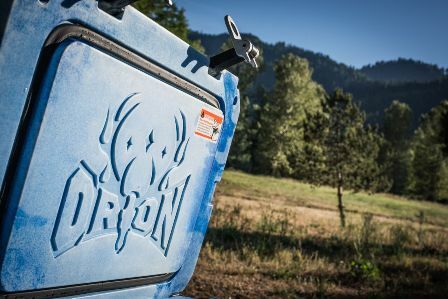 From the makers of Jackson Kayak, this is a new cooler with top of the line features that brings a new standard to the industry. It is my personal favorite cooler in the shootout because it is going to make the competition play catch up with design. Handles- A low stretch rope is supporting a solid handle. The molded in handle could be a little more comfortable on the hand with a full cooler. Latches- Recessed, cam style aluminum latches with a positive feel when locked. This design is definitely kid approved. Finish- Smooth and offered in wild colors just like their kayaks but not offered in solid white which is a bummer. The upper corners have aluminum bumpers and the lid has a foam insert to form a non-slip surface with their logo inside of it. Drain- Nothing fancy here with this unattached plug but more than adequate to get the job done. 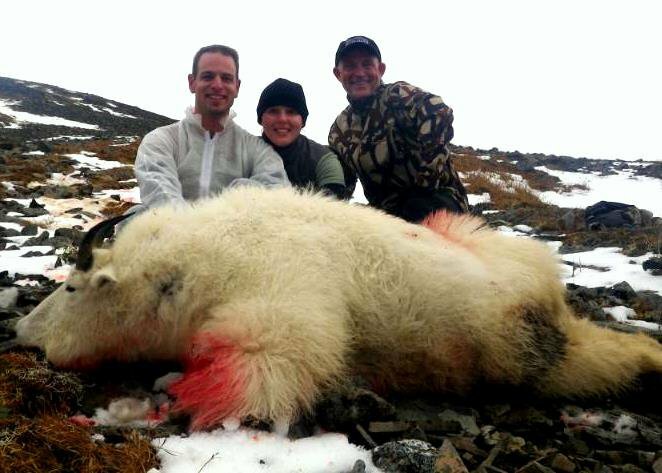 It is very similar to the plugs found on Yeti. Features- Along the sides, you will find YakAttack strips to mount RAM accessories. You can mount multiple accessories on these rails. You will also find the metal corners have a built it bottle opener on the inside of them. This cooler is also lockable on the corners. Inside, you will find a plastic tray and a flashlight. The tray holds the light so you can see your contents hands free. Actual capacity- 52.16 quarts and weighs 34.5 lbs empty. 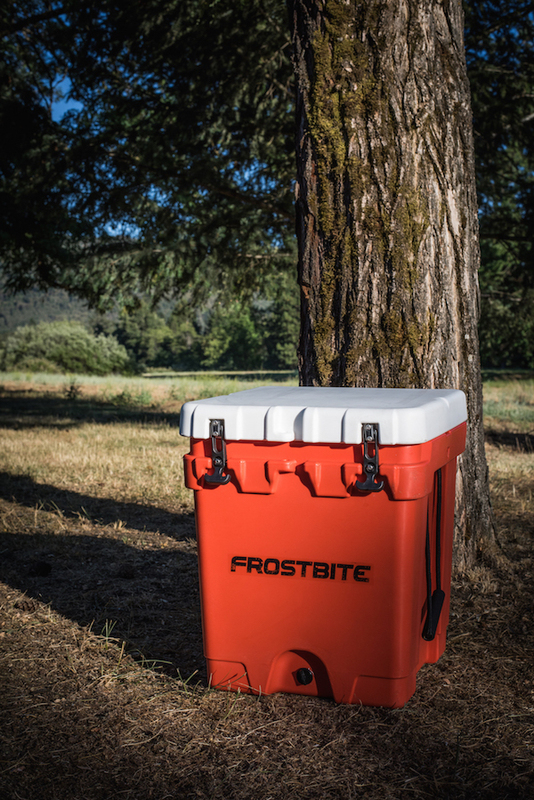 Frostbite is meeting the demands of ice retention while keeping a lower price point for the budget conscious hunter. This cooler is meant for the no frills, no BS type who doesn’t care about anything but ice retention and not paying an arm and a leg for it. Handles- The ropes are a little stretchy but the handles are comfortable. The molded in handles fit the hand well. Latches- They are similar to the Yeti but do not seem to keep as much tension as they should. The latches also fall in the way of the lid closing so it is one more step to shut the lid. Kid approved for sure and having them recessed makes the cooler look cleaner. Finish- Almost as smooth as the Yeti and the rounded corners adds to the simple lines. Drain- Easy to grip and a solid feel but is unattached. Features- Lockable on the corners and has rubber feet to prevent skidding. Actual capacity- The actual capacity is 54.32 quarts and weighs 29 lbs empty. 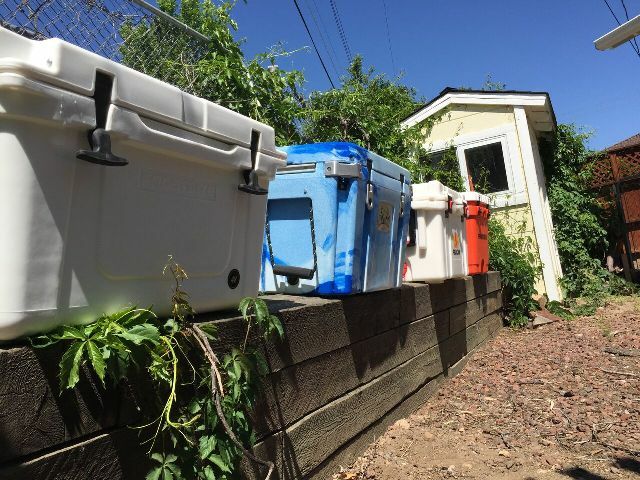 After I filled the coolers all the way up with ice, I set them out in the back yard where they would receive identical sunlight throughout the day. They would be in the direct sun from around 7:30am until 5:30pm. As much as I wanted to, I couldn’t control the weather in this test but the coolers were all exposed to the same elements. Our highest temps were recorded at 94, while lowest was 49 over the 11 days of testing. 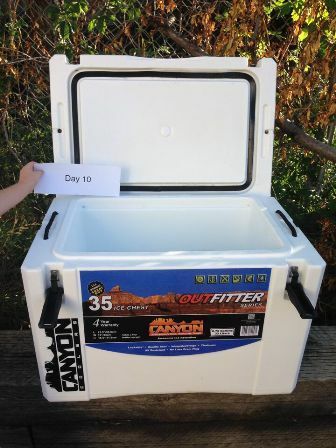 The clear winner was the Canyon Coolers outfitter 35 holding ice for 10 days! 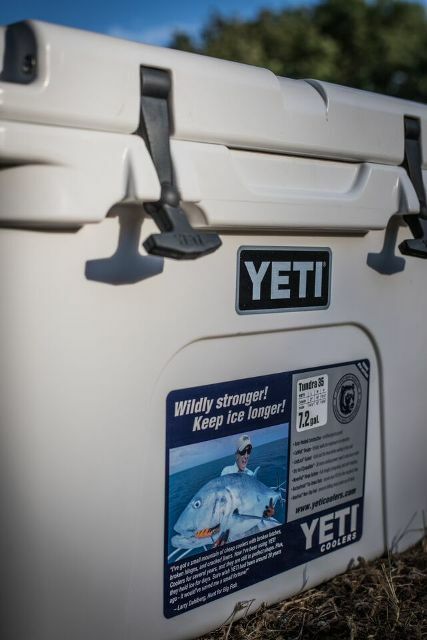 It held ice through one more round of sunlight than the Yeti and also must be noted, it placed 2nd overall even compared to coolers that are almost 1/3 bigger. 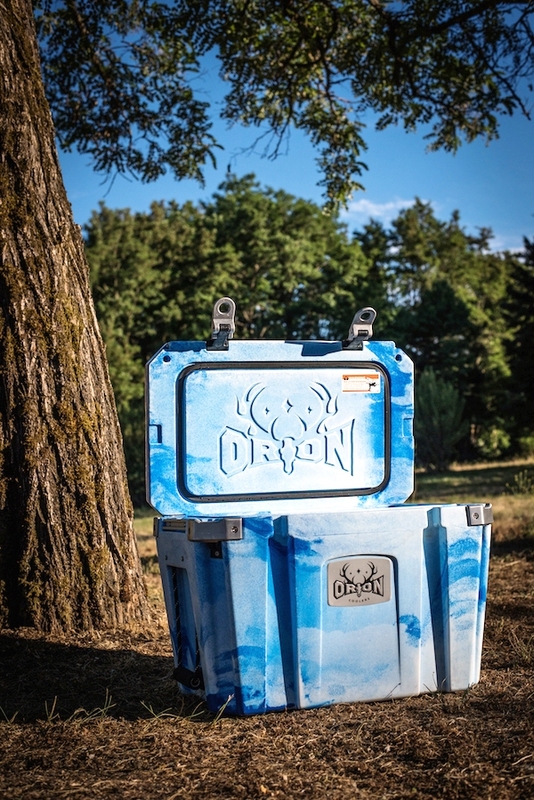 This cooler rocks and I would recommend it to anyone willing to listen. I put the Yeti to bed on day nine with a small amount of ice remaining but it did not make it through the night, however nine days is still quite a feat. 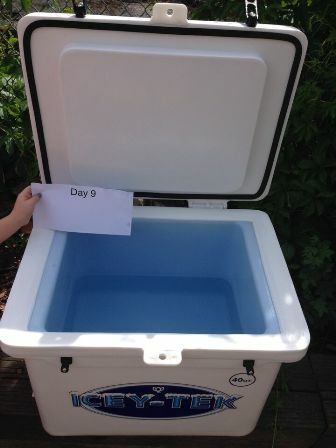 Both coolers made it to day nine but the Icey-Tek 40 made it through the operational period that day edging out its competition by 6.5 hours. Orion 45 was the only cooler to make it to day 11. This is quite an accomplishment given the color! On day eight, I took a surface temperature of 124 degrees during the hottest part of the day. I thought it would fade fast after that but it pulled through to see the longest ice retention. The Frostbite R 48 succumbed during the night of day nine paving the way for the Pelican Elite 45 to come in second. The Pelican finally let hold of its ice around 2:00 pm on day 10. I am amazed at how well all of these coolers performed. 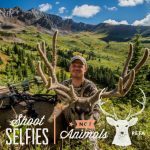 I wouldn’t hesitate to trust any of these in the field with my hard-earned game meat. 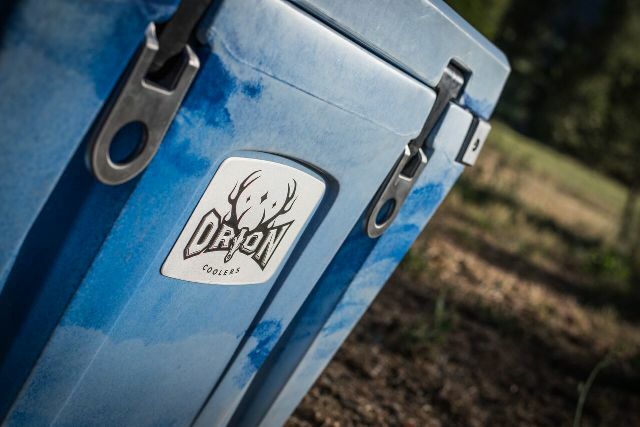 The tests don’t lie however, and if you want the best of the best, Look hard at Orion Coolers and Canyon Coolers. 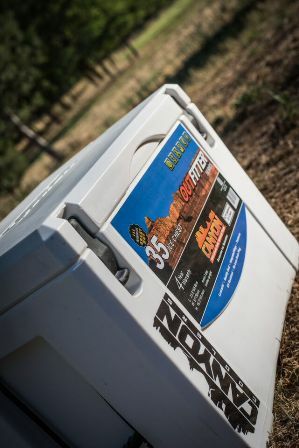 It’s your money so spend it wisely on the cooler that is right for YOU.